Friday was my birthday and my husband took some time off and treated me to a wonderful day. Thanks honey! I thought I would share an idea of where I get my desire to paint cupcakes and cakes. In the photo below I was celebrating my birthday at the tender age of 3. Who would have guessed what a dessert freak I would become! My sweet older brother, Joe, stepped into the scene to help me carry this heavy load. As you can see from my dismay, I thought he wanted it all to himself. In the end I'm sure I won out and gobbled up that heavenly concoction which led to the slim and trim figure that I had the time. 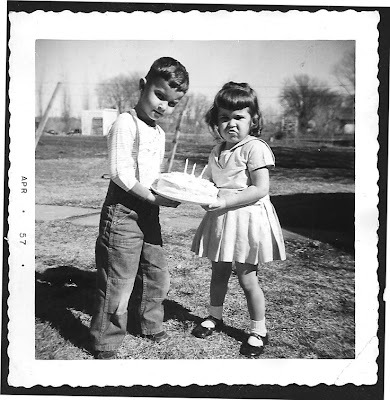 The look on my face says it all, "Get your hands off my cake!" Which leads me to mention that this print is now available in my Etsy and Ebay stores! I love the history behind stories like this!!! now, I have a sweet tooth. LOL! What a great childhood memory! Happy Birthday! Belated happy birthday, Catherine! That photo is priceless! You have a very determined look on your face and I'm sure you were the victor in the cake tussle. What a cute family photo and a great story about your cupcake beginnings. Catherine, happy belated birthday! Glad you had a nice day with your hubby! I love that picture of you and your brother! It is priceless! Thanks for sharing such a wonderful story. That would make such a cute greeting card, with exactly that sentiment..."get you hands off my cake"!!! Love this post and very happy belated birthday greetings. Will look forward to another stellar year of accomplishments. Well, Happy Belated Birthday! I'm glad to hear that you had a nice day with the hubby. That is a fantastic picture of you and your brother. I agree with the above commenter, it would make a great image for a card! Happy Birthday to YOU! I'm glad you had a good day and shared your photo with us! OH MY! What can I say! What a determined look on your face! I bet you stood up to him your whole life! heehee! Love your painting, too! I don't think I have any of your cake or cupcake paintings! HHHmmmm!!! Happy Birthday to you!. My Birthday is this Saturday.I bet I'm older than you. I just love the picture of you and your brother, I think I may have some like that too with my little brother. gaan jullie daar in wonen of vakantie vieren. Happy Belated Birthday, Catherine! What a great photo of you and your brother. How cute! No wonder you like cakes and sweets so much. I hope you had a wonderful day and thank you for sharing this story. Had to chuckle at the expression on your cute little face! Now you can paint all the cupcakes and cakes you want! Great story! I love the expression on your face, Cathie! Great post! Beautiful photo!